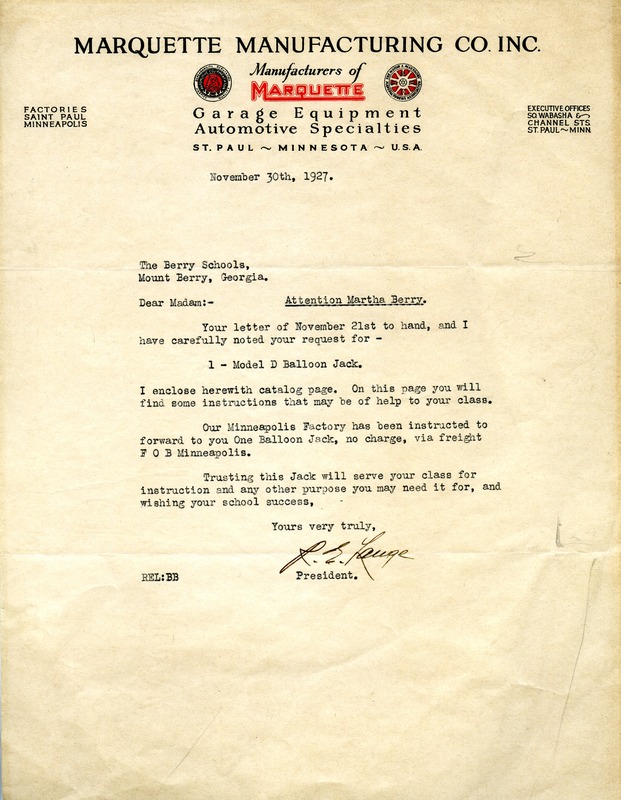 Letter to Martha Berry from R. S. Lauge, president of Marquette Manufacturing Co. Inc., in response to a request from Miss Berry for a Balloon Jack for instruction at the school. Mr. Lauge agreed to send her one from the factory free of charge. Mr. R. S. Lauge, “Letter to Martha Berry from R. S. Lauge.” Martha Berry Digital Archive. Eds. Schlitz, Stephanie A., Christy Snider, Ellen Rayburn, et al. Mount Berry: Berry College, 2012. accessed April 21, 2019, https://mbda.berry.edu/items/show/8370.